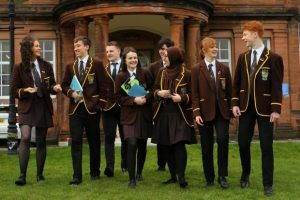 Jordanhill topped the Herald’s list of state schools for Higher exam results published on 20th March. “ School empowerment is at the forefront of the Scottish Government agenda for school improvement and the partnership between home and school is an important dimension of this. Engaging with parents and helping them to understand how they can best support their child is a core element of our work. Any success we may have reflects our philosophy of supporting and challenging each young person based on their individual strengths and needs. The work done by our pupils on anti-bullying and in achieving the Gold Rights Respecting School Award has been central to creating an inclusive and supportive culture in which everyone can achieve to their full potential. The only comparison we make is with what might reasonably be expected of each individual. The outcome of empowering our teachers, pupil support assistants, parents and pupils is that our pupils consistently achieve far beyond what might reasonably be expected regardless of their home background, gender, race, additional support needs or abilities.